Ticks are parasites which live by feeding off the blood of humans and animals. They do not jump or fly but use their legs to attach to the skin of their victim. They go through 4 life stages of life: egg, larva, legged nymph, and adult. After hatching from eggs, ticks must eat blood at every stage to survive. Ticks live in shady, moist areas at ground level. They will cling to tall grass, brush and shrubs. They also live in lawns and gardens, especially at the edges of woods where the woods transitions into low lying grass, under decks and around wood piles. The 3 ticks which live in NYC and Long Island are the Lone Star tick, Dog tick, and Deer tick. gy manifests as hives, itching swelling, gastrointestinal stress and in severe cases subjects can go into anaphylactic shock after eating red meat. The Dog tick is typically found on dogs, but also attach to humans. The 8-legged adult male and female ticks are typically brown to reddish-brown in color. They are responsible for transmitting Rocky Mountain Spotted Fever and Tularemia. Symptoms of Rocky Mountain Spotted Fever can first be seen by the appearance of a rash around the wrists and ankles that moves slowly up to the rest of the body and develops within 2–5 days. Symptoms of Tularemia can usually be seen within 3–5 days but can take up to 21 days before symptoms appear. The Deer tick (found mainly in forest areas) is smaller than the Dog tick. Adult female Deer ticks have red and brown bodies and are larger than males. Deer ticks are the species responsible for transmitting Lyme disease and about 50% of deer ticks are infected. Lyme disease causes a rash, often in a bull’s-eye pattern, and flu-like symptoms. 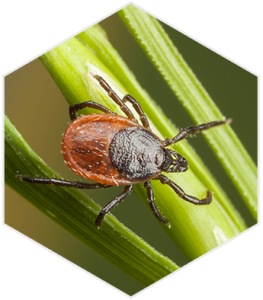 In most cases, the tick must be attached for 36 to 48 hours or more before the Lyme disease bacterium can be transmitted. For years, Predator Pest Control has effectively regulated and treated all tick issues in the 5 boroughs and Long Island. Predator pest control can provide an alternative to pesticides for any chemically sensitive customers that request a natural alternative. 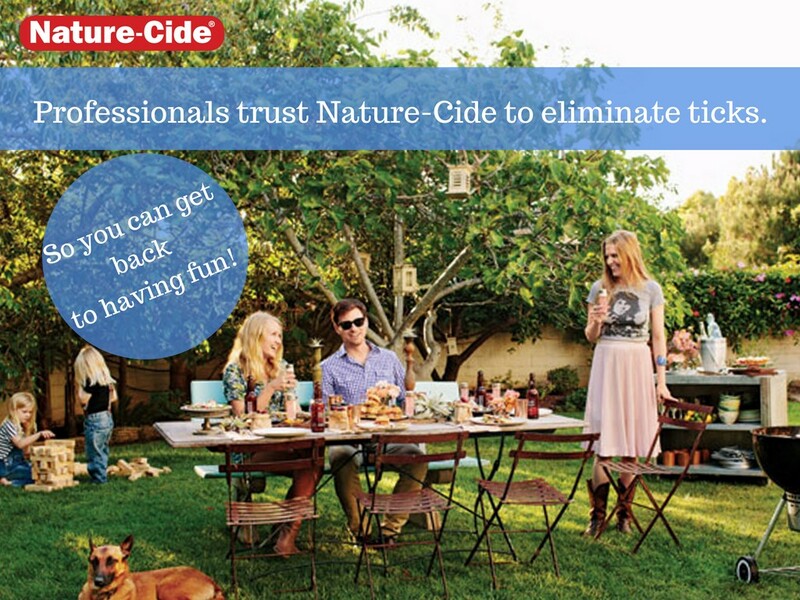 One such product we use is called “Naturecide” which is 100% natural and has no known mammalian toxicity. We have been using it to treat ticks and mosquitos with great success. Predator pest control also uses restricted Acaricides, (an effective pesticide that kills ticks & mites) & IGR`s (insect growth regulators) to control and exterminate ticks around residential areas, making areas safer for children, pets and adults. Once such treatment is Archer Insect Growth Regulator. Archer prohibits ticks from maturing into adult reproducing females hence stopping them from laying eggs and reproducing. After treatment is completed, you can expect sufficient control of ticks for the following 60-90 days. All sprinkler systems should remain off for 48 hours following retreatment. Sufficient notice will be given to all residents and any residential house or facility within 150 feet of any treatment site at- least 3 days before any treatment is performed. We will flag all lawns and areas that are treated which will indicate the date & time people and or pets can return to the area.